Retrieve the bike and 3 spokes on the front wheel are completely loose, leaving the wheel wonky. To be honest, it's not exactly a surprise with road wheels and disc brakes, especially when they are only tensioned by machine in the factory - I think it's something to do with 'torsion', but I'm not an engineer. Manage to wobble along to find a bike shop in Crediton to sort it out. For such a small place, there's a terrific bike shop and the mechanic sorts the wheel out for a fiver. Top man! And he tells me that there's only one more hill before the Somerset Levels. So, much happier, I head off. There do seem to be dozens of hills, but perhaps they have a different idea of what counts down here. Lunch in Taunton with Clare, who's sticking around until tomorrow, but feeling pretty grumpy with exhaustion. Finding facing the afternoon difficult, by it turns out to be the best yet. 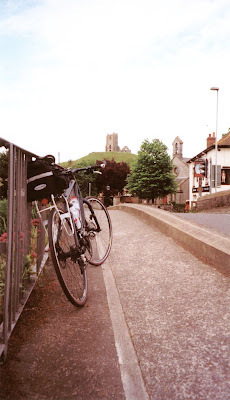 Speeding over the Levels to Glastonbury through beautiful villages. There is a lovely abandoned church on what must have been an island in the marshes and then Glastonbury Tor appears on the horizon, seeming to glower. Cycle on to Wells, where we are staying with Clare's cousin James, who works at the cathedral school. A much needed bath to ease my aches and pains and we are treated to a great meal thanks to James's mum, Clare's Auntie Eileen!